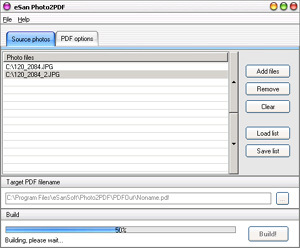 eSan Photo2PDF is an easy to use software tool that helps to create your own photo albums in Adobe PDF format (Portable Document Format). The PDF format is a standard and general format in electronic publishing. The photos can be JPEG, PNG, BMP, PCX, TIFF, WMF, EMF, ICO, CUR, GIF, etc. The photo albums in PDF format can be viewed by anybody with Adobe Acrobat Reader(TM) or print it out. Create photo albums in PDF format easily. ...... With this software you can effortlessly build your PDF photo albums with 1 or 2 steps! Create your own electronic photo albums from now! Create mp3 from audio CD tracks or wave files. Burn normal audio CDs from MP3 or wave files. Qweas is providing links to eSan Photo2PDF 1.0 as a courtesy, and makes no representations regarding eSan Photo2PDF or any other applications or any information related thereto. Any questions, complaints or claims regarding this application eSan Photo2PDF 1.0 must be directed to the appropriate software vendor. You may click the publisher link of eSan Photo2PDF on the top of this page to get more details about the vendor.